Coach Woody Walters leads the Ohlone JOAD Club and all training sessions. 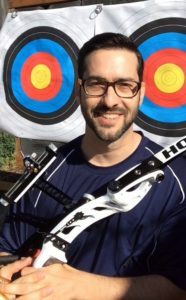 He is a USA Archery certified Level 3 Coach, and is the Western Region Representative for the USA Archery JOAD Committee. Coach Woody’s goal is to create an inclusive archery experience which is equally fun for all and challenging enough to nurture the gifted athlete. Utilizing a cooperative instructional approach, he inspires confidence and a sense of accomplishment by creating a foundation in the National Training System (NTS)/KSL Shot Cycle, an understanding of the equipment, and encourages the setting and achievement of goals. The Ohlone JOAD Club is both an official Junior Olympic Archery Development and Explore Archery program certified by USA Archery, our national governing body for the sport of archery. The program was founded by Coach Woody Walters in October 2016 to spread his love of archery and address the under-served community seeking an archery experience that caters to youth. Coach Woody offers private lessons upon request for archers who want to develop a higher level of skill, understanding for the sport, or who want to develop at a faster pace. Woody Walters contributes to the Ohlone Archery Blog – type “Woody Walters” in the blog search engine. Lessons cost $45 per hour not inclusive of any lane rental fees at the archery range.